On Sunday, I hosted a reiki share at Lakeside Retreats. When all eleven of us had gathered in a circle to begin our time together, we placed our names into the group and responded to, “What calls you here today?” Responses varied from wanting to experience reiju to being with fellow practitioners in an intentional way. We entered a deeper conversation when I posed the question, “What’s in your heart and on your mind about reiki?” This deceptively simple question opened up an amazing discussion. Some people had stories of hands-on healing on themselves or others. Others spoke about how the five precepts of reiki keep them centred for the day. Others had confusion or questions. Still more people had suggestions for those with questions. I loved the lively yet respectful conversation that flowed and bounced from person to person! Then we moved to meditation, reiju, and treatments. Notice how an uncomplicated question led to a complex and rich discussion from which everyone benefited. Next time you want to invite diverse perspectives and further discussion around a topic in your group, try asking, “What’s in your heart and on your mind about _______?” You may surprised at what emerges. Let me know how it goes! Bev Haskins and I were scheduled to offer an Introduction to Circle Process on the afternoon of Saturday, May 28. Three people signed up. We decided that it would be healthy to keep the energy of the event alive by running it. We also feel that circle process is vital as a way of being and interacting in these times in our culture. The two of us plus the three attendees would have made five people having an enriching conversation about the principles and practices of circle and how we might apply it in our unique ways. Sounds like an engaging afternoon to me! Two of the potential participants were going to attend together. When they heard from us what the size of the group would be, they bailed out, saying that at least six participants would be more interesting. Needless to say, the Intro to Circle is postponed. I’m curious about what these folks meant by “interesting”. The practice of circle takes any configuration of people — whether two or twenty — and weaves their sense of depth and connection. Authentic engagement takes place. That, for me, is far more important than how “interesting” a larger group would be. This obsession with bigger-must-be-better is so ingrained in our culture. How might we return to quality rather then quantity? If I want “interesting”, I can read a good article, watch a documentary, or go to the museum. If I want “authentic engagement”, I can invite some peers to gather around a central intention, pose an open-ended question, and listen through my heart to what emerges. Who will join me in authentic engagement? What is the conversation we need to have? What vision might guide that conversation? What is our intention for our time with one another? I really hope that the work I bring to the world is more than interesting. May Life grant that it’s authentic. “I want to write on my blog, but what should I write?” kept running through my head a few minutes ago. On the other side of the table sat my copy of the Celtic Wisdom Tarot, so I decided to grab a card from the middle of the pack in response to my aforementiond question. I received Trump 18, the Imaginer, which would be the Moon in most other decks. Several of us members of the Gaian Tarot Circle are gathered somewhere “out of town”. It feels like a place that’s a strange blend of urban and rural (both field and hotel). We catch the news and energy of an emergency that’s taking place nearby. We grab our GT decks in their bags and prepare to go to the emergency. Part of our preparation involves a simple blessing: at one point Joanna brings me her deck in a bag and I draw a sort of clockwise inward-spiralling symbol over it and declare, “There, it’s activated.” We now feel ready to tackle what’s happening in the world around us. How might we employ our spirit-based, soulcentric tools in ways that benefit the whole? What does activating our connection to Something Greater look like? Who is in each of our tribes/circles? To what or to whom are these tribes/circles dedicated? What in-between places need our attention and care? What is the larger issue that’s being carried in a personal neurosis? What does “being on the edge” mean for each of us? Who might come running to us? What support are we truly capable of offering them? What does each of us carry in our personal medicine pouches? What activates those medicines so that they are of value to our culture or world? What are we ready to tackle? What are we not ready to tackle? Then who is? What might a creative convergence of Earth, tarot, and circle process look like? What other questions does the dream invite you to ask? What other questions or dreams are inspired by the Imaginer card? Please, friends, tell us. Please feel free to leave comments on both of our blogs. And please join us at the Omega Institute in July! Tarot: Fate & Free Will. Tarot reveals the forces that drive each of us. By illuminating unconscious patterns, as well as outer circumstances, it frees us to explore a range of choices and make wise decisions that favor conscious evolution. As tarot readers, we serve as guides to the future, and this means helping people discover their true will. It’s a tremendous responsibility. At the Omega Tarot Conference, international tarot readers Mary K. Greer, Rachel Pollack, Marcus Katz, James Wells, and Ellen Lorenzi-Prince show us how to direct the powerful dance between fate and free will when reading the cards. In hands-on sessions, they guide us to fully realize tarot’s great gifts for helping people meet whatever will be in the best possible way. In the process, we become more well-rounded readers for others, and ourself. Beginning and experienced tarot readers alike gain specific tools to sharpen and refine their readings. Bring a deck of tarot cards. Last Friday, Saturday, and Sunday, 200 + of us gathered in a hotel in Queens, New York to immerse ourselves in tarot. It was the Readers Studio, the conference hosted by Tarot School founders Ruth Ann and Wald Amberstone that I attend every Spring. I believe that it’s important for tarot practitioners (actually practitioners of any kind) to stay fresh, so even though I’ve been working and living with the tarot for more than 31 years, it’s vital for me to be there. Besides, I get to hang out with a tribe that’s important to me. This year’s three key presenters were Corrine Kenner, Barbara Moore, and Caitlín Matthews. As I experienced each workshop, I became aware of themes such as patterns, maps of knowing, and connecting with something larger than our own issues. Below are my thoughts about each session. 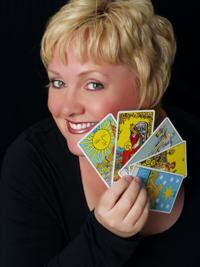 CORRINE KENNER, Tarot and Astrology. 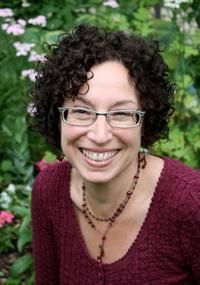 Corrine took us on a tour through good basic astrology and how we tarotists might employ it — the chart as both calendar and clock, the 12 houses, planets and signs, which Major Arcana cards correspond to which planets and signs, and how to use tarot to look at a person’s birth chart through the lens of the cards. I’m reminded here of the notion of resonance or correspondences, that some things naturally “ring” with others. I love how different maps of consciousness — in this case tarot and astrology — can deepen one another, even though each also stands on its own. There are a few times when clients and I have examined their astrological charts with the cards. Corrine’s well constructed and easy-to-follow workshop reminded me that I’d like to do more sessions like that. So, if you’d like to see your natal chart from another perspective, please let me know! BARBARA MOORE, Tarot Spreads: Make Your Readings Even More Fabulous! Barbara guided us through the components that go into creating and using a good tarot layout. This is a topic dear to my heart because I most often create spreads for myself and clients based on what it is we really need to explore in the moment. For Barbara, and for me, a good layout helps to focus the consultation, shapes the responses we receive, and makes interpretation easier. As I reflect on Barbara’s workshop, I’m reminded that a tarot spread gives a client and me a rock solid contract about what we’re to explore together and it gives us both a clear map of our time together. Custom-created layouts help our imaginations, intuition, and Wisdom Source to tune in to what’s relevant. The layout I designed in this part of the conference is based on the Elder of Fire in Joanna Powell Colbert’s Gaian Tarot (I’ll publish it in another post). CAITLÍN MATTHEWS, Hunting the Lady: Using the Significator Skillfully. The use of the significator, a card on the table to represent the client, has generally fallen out of favour these days. The old way of using a significator was to base it on the person’s physical appearance and/or star sign. I’ve never been fond of them myself, but Caitlín enlivened my interest in significators by bringing a fresh take on how one might employ them. Activities such as dealing the card into a specific number of piles and using the one containing the client’s representative card might seem quaint, but Caitlín’s use of this sort of method reminds me that such activities are rituals designed not only to pick certain cards, but to focus our intent and to invite us into the sacred space wherein dwells our wisdom. The last section of this workshop was an onstage ceremonial healing for a member of the audience. Different significators represented various parts of the querent’s soul. Using dialogue and prayerful sound, something shifted. This was profoundly moving and an energy-changing experience for many of us. The dabbing of tearful eyes at many tables was noticeable. During the Introduction of Presenters, Caitlín said two things that absolutely pierced me to the core. First, she said that those of us on the edge of society — diviners, tarot consultants, shamans, et al — are where we are so that when those in the centre of it come running to the edge seeking help, we will be able to meet them and be of assistance. Wow! Caitlín’s insistence that we uphold the dignity of the oracle also touched me. I think of my decision several years ago to no longer do tarot readings at parties. In addition to the inconvenient schlepping involved, I am NOT the tarot equivalent of a balloon-twisting clown or D-List lounge singer. I am an ambassador of the sacred art and practice of tarot counselling, a guide, a server of souls, and a host of wisdom councils. I stand in solidarity with Caitlín to keep the dignity of the oracle intact. Of course, there was the added dimension of social time with friends and colleagues. Meal times generated both creative depth and creative hilarity. The shopping was great; I have more decks and books now than before I left for the Readers Studio! I offered some private tarot consultations and a study group on Reading the Minor Arcana. The Readers Studio was again an opportunity to do what I love in a concentrated setting. Next year, the three key presenters will be James Wanless, Shawn Nacol, and me. Please join us in April of 2012 as we gather again in NYC.